HOT LUNCH begins this week and we need you! Back to School BBQ success! ​​​A HUGE thank you to Carol Sartor our PAC Chair for organizing such a great event. Sprucehill Contracting for your muscle and wheels to transport the bouncy castle. Avril, Carmen, Cathy, Dave, Erik, Federico, Folkert, Helen, Jane, Janet, Ken, Leila, Lianne, Natasha, Nina, Rebecca, Scott, Steve & Yvonne. Thank you to James and Leila for capturing images for the yearbook. Finally, thank you to ALL families who attended and brought treats to make the event even more special. We hope you had a great time and were able to connect with fellow Montroyal families. Think you missed the deadline for Hot Lunch ordering? You can still make changes, additions and deletions to your hot lunch orders up to 8 days before the actual lunch date. For example, if you place your order tonight (Sunday) your first lunch is next Tuesday, October 4th. Don’t miss out and save yourself time from making lunches. Go to montroyal.hotlunches.net. See the full Agenda here. We hope to see you there! All students in Grades 4-7 are welcome to join. Choir will be held at 8:00 am Thursday mornings in the music room beginning September 29th. The 3rd Annual Orange Shirt Day to commemorate the Indian Residential School experience is Wednesday, September 30th. Orange Shirt Day is an opportunity to create meaningful discussion about the effects of Residential Schools and the legacy they have left behind. It's a day for survivors to be reaffirmed that they matter and so do those that have been affected. Every Child Matters. Wear something orange to show that you care. ​Find out more about the why the Ministry of Education is adding an aboriginal lens to the new curriculum here. Band, Strings and Music Class Reps needed! We now have all divisions filled with the exception of our fabulous musical programs. Class rep duties include: sending communication to parents with upcoming events, gift organization, collecting funds and communicating all changes/cancellations in the schedule. Please contact: Jane Alpen for any questions or to volunteer. Interested in volunteering your time? MPAC is always looking for volunteers and we have many opportunities throughout the year. Visit our Volunteer page for more information and get involved. Join the Book Fair Committee! Our Emergency Preparedness Group is updating our emergency supplies. Your MPAC has purchased emergency food bars for each child in the unlikely event of an emergency. Please click here to review the ingredient list carefully. If your child has an allergy to any of the listed ingredients, please let your teacher know and bring in 6 peanut-free bars in a ziplock bag labelled with your child’s name. These bars will be added to the classroom's emergency kit. Please bring these in by September 26th. If you have any questions or concerns please contact Pearl Van Dijk or Shannon Harris. Do these belong to YOU? We still have some dishes remaining from last springs Grade. 7 tea! Kindly come and pick your dishes up. Thank you!! 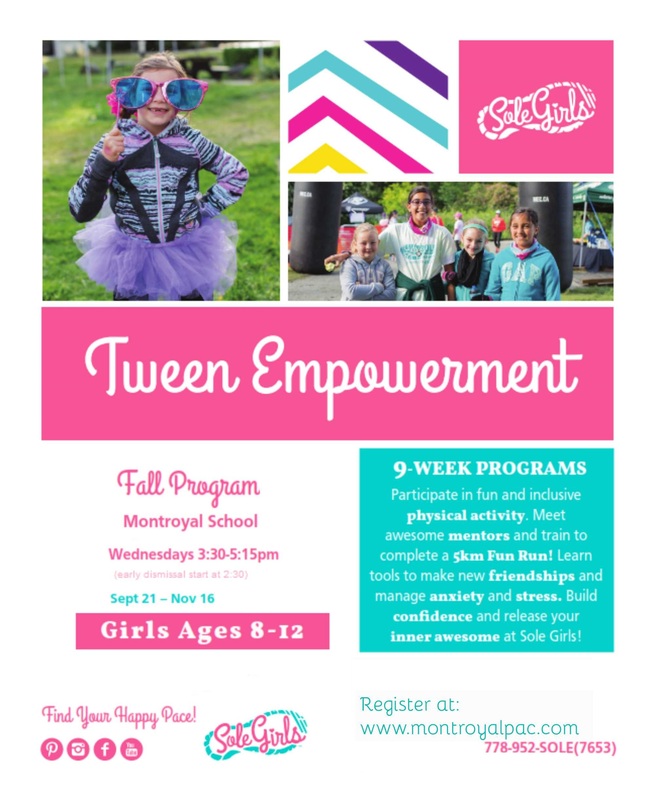 Here are our new lunchtime and after-school programs at Montroyal this fall term. Registration is open now. Click on the image to find out more about each program. Montroyal has participated in this international event for over 10 years, it is a school tradition that the students love no matter the weather. Why - The best way to build a strong school community is to meet people, this events has students having fun with all students no matter grade and parents can join in or talk with each other. School connectedness has positive impacts for students academic performance, mental and physical well-being. Did you know? Only 9% of Canadian children get the 60 minutes of heart pumping physical activity they need each day. This event shows kids have the energy to walk and play before school.